Chat Extensions let bots provide interactive, social features that users can invoke directly into their conversations. Chat Extensions help bots integrate interactive features into user conversations. This means the bot user will be able to share content from your bot directly into the conversation. 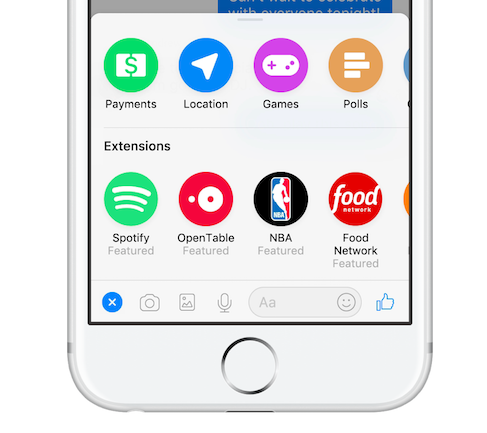 Extensions appear in the Messenger once the user has interacted with the chatbot. They can be accessed by tapping the blue “+” button in the messenger composer. The user will then pick the chatbot they interacted with and get access to a developer-specified webview. On your site, you’ll need to set up a separate page for the webview to work. The steps described in this article will help you develop a specific webview page for your bot. The webview will turn on automatically once you whitelist the domain for it in the Configure tab of the Chatfuel dashboard – you’ll find the box for whitelisting domains at the bottom of the page there. To make Chat Extensions available for your bot, go to the Grow tab, tick the “Enable Chat extensions” box and paste the URL of the page the webview is set up on. Now every user that has ever interacted with your bot will be able to access its Chat Extension via the “+” button in one-on-one or group chats. A planner bot that lets people make up plans for various occasions, share it with their friends and discuss/edit the details. A music bot that allows people to create and share playlists that remain in the conversation and can be accessed at any time. A news bot from which users can pick out news concerned with specific group of people and share it in the conversation with these people.